Radiant barriers are installed in homes to reduce solar heat gain in the summer time by reducing the radiant energy allowed to pass through the attic. They have a better impact in low-lying roofs where the attic space is very small. This is because the hot air is trapped right on the living space and can't rise up and away. 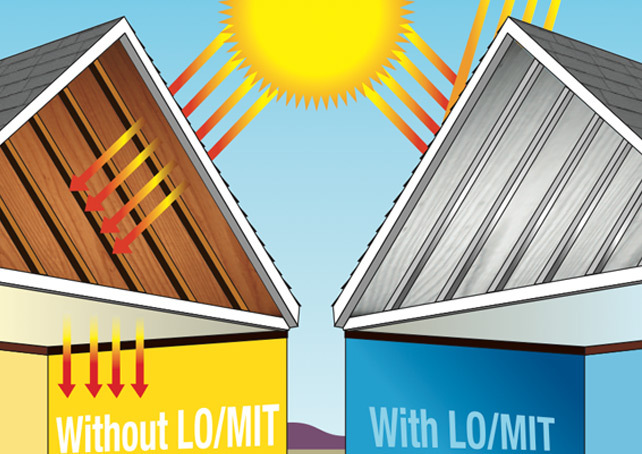 Foil type radiant barriers are typically better than spray on except for 1 product, Lo-Mit Max. If you install the right spray-on, you pay far less for the labor and the performance is almost identical compared to foils. From our experience, Radiant barrier typically falls in 4th place when it come to comparing it's impact and it's cost-effectiveness. The order from most to least is Air Sealing, Insulation, Solar Attic Fan, Radiant Barrier. When the sun heats your roof the majority of it is caused by radiant energy. This radiant heat energy is then radiated from your roof to the cooler surfaces in your attic such as your air conditioning ducting and your ceiling. A properly installed radiant barrier reduces this radiant heat transfer making your home cooler and lowering your utility bills. There are many different types of radiant barrier available today and not all are created equal so it's important first to know that the product you install is a quality product and second that it's installed properly. Copyright © 2011, Energy Guys, Llc.